PALM SPRINGS, CA – Game one on the auxiliary field was highlighted by hot bats and stingy pitching which led to an 8-1 victory for the Alberta Grizzly over the Canada A’s. The A’s got things started in the first inning when Ben Mauseth reached on an error and came around to score on Joshua Henderson’s double, but that was the only time they would light up the scoreboard. The Grizzly came roaring back in the third inning, scoring six runs on three hits. After loading the bases with no outs, Bill Pearson cracked a double off the center field wall to score two runs. Ryan Whitt stepped up to the plate next and blasted an opposite-field three-run homer to make the game 5-1. Brook Clark was the sixth run of the inning after hitting a double and scoring on a sacrifice fly. Four straight singles by the Grizzly in the fifth inning resulted in two more insurance runs and rounded out the scoring for the day. Jensen Kirch went the distance for the Grizzly on the mound, only giving up three hits and striking out three batters while pitching five innings. The Manitoba North Stars took down the New York Colonials 4-0 in the first game at Palm Springs Stadium. Ryan Gowens went the distance to earn the win, allowing just two hits and two walks over seven scoreless innings with two strikeouts. The North Stars pushed across the games first run in the top of the second. Eric Elkus hit a one-out single, stole second, moved to third on a pop fly, then scored on a Nick Campana double. The North Stars added three more in the third. Trey Bridis drove in one of the runs with a sacrifice fly, while the other two scored on errors. Judah Wollenburg finished 2-for-3 with a run and a stolen base for the North Stars in the win. The second game on the auxiliary field turf saw the Toronto Rush suffer their first loss of the young 2019 CWL season at the hands of the Washington Blue Sox by a final score of 1-0. Keiichiro Iwaya, Rizumu Yasukouchi, and Gen Utamura combined to throw seven shutout innings for the Blue Sox, striking out five batters and allowing seven hits. Left-hander William Myers endured a tough-luck loss for the Rush, but continued to shine on the mound this season with another masterful outing, going five innings, allowing only one earned run, and recording ten strikeouts while only issuing one walk. 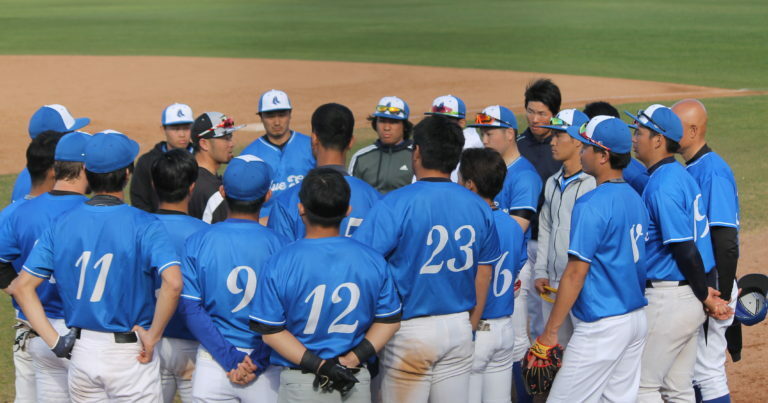 Kyle Stahl went 2-for-4 in the and scored the lone run of the day for the Blue Sox after he led off the second inning with a triple and came home on Tatsunori Negishi’s RBI single. The Oregon Lumberjacks took down the Palm Springs Chill 3-1 in the second game at the stadium. Michael Stryffeler went four innings, allowed two hits and a run, with six strikeouts to earn the win. The Lumberjacks pushed across the games first run in the top of the first. Reinaldo Gonzalez singled, moved first-to-third on a double, then scored on Jordan Lambert’s sacrifice fly. The Chill tied it up in their half of the first on an RBI triple from DJ Daniels. The Lumberjacks took the lead in the third. Jonathan Howard led the inning off with a single, then came into score on Lambert’s second sacrifice fly of the day to make it 2-1. Oregon rounded out the scoring later in the inning when Gonzalez scored on a wild pitch. Gonzalez finished 2-for-3 with two runs scored and Trevor Westmoreland finished 2-for-3 with two doubles. Tuesday at the California Winter League, is 2-for-Tuesdays. 2-for-1 admission, $2 non-alcoholic drinks, and $2 hot dogs. The 10 AM game features the British Columbia Bombers at the Oregon Lumberjacks, followed by the Palm Springs Chill taking on the Palm Springs Power.